This is a mouth-watering, slow cooked chicken that takes about 15 minutes prep time. 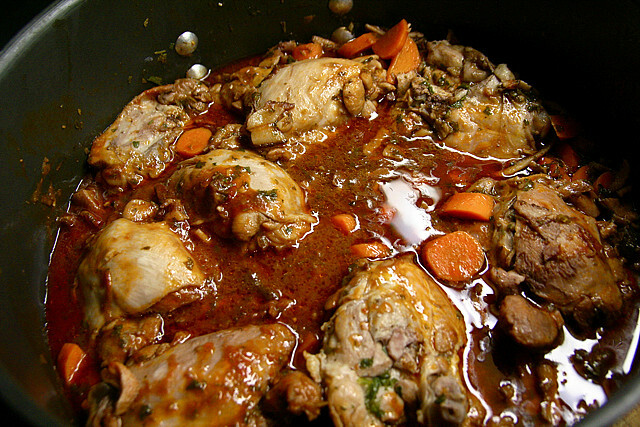 I’ve added my own sweet touch and lowered the fat from the original French coq au vin versions. Perfect for those busy work days! Wash and dry chicken pieces. Sprinkle with salt or garlic salt and pepper. Lay the chicken in the bottom of the crockpot in one layer if possible. Sprinkle with the brown sugar. If unable to layer chicken in one layer, sprinkle each layer with the brown sugar. (Use all of the sugar). Mix the Sriracha sauce into the red wine and pour the mixture down the side of the crock pot so as not to disturb layering if possible. Cook on the low setting for at least 8 hours. Remove the chicken, carrots and onions from the liquid and keep warm. Pour the liquid into a pan. Removing anise and rosemary stem. Cook on medium high heat for about 5 minutes to reduce by about 1/4. It will form a lovely sauce. Pour over warmed chicken and serve. This is just incredible with some crusty bread for dunking into the sauce and a lightly dressed green salad on the side.